If have chosen to make an adoption plan for your baby, you have the option of choosing an adoptive family for your child. You may have already done so. As an expectant mother, you have a great understanding of the life you want for your baby. You may already know the type of home and parents you want your baby to have. Most of all, you want what is best for your baby, and after looking through our many adoptive family profile books, you believe you have found a family (or several) that could be a perfect fit. While profile books are a special way of initially “meeting” each waiting family, you always have the option of meeting a family in-person or over the phone. If you feel ready to take this next step in your adoption journey, Adoptions With Love can arrange a meeting between you and the prospective family you choose. You can meet them in-person prior to the birth of your baby, at the hospital the day your baby is born, or following the adoption placement. At your convenience, they will come to you, wherever you are. If you desire to meet an adoptive family through a phone conversation or internet Skype session, we are happy to arrange that as well. It is normal to feel nervous about taking this next step. Meeting a potential family for your child can feel much like a first date. You want them to be the perfect parents for your baby. You hope that you have things in common and that the conversation goes smoothly. It usually does and can bring you great peace of mind. You are not alone. The prospective parents will want the same. Like you, they are both nervous and excited to meet you for the first time. They want you to like them as possible parents for your baby and in many ways, as a family to you as well. If you wish to have an open adoption plan, the adoptive family you choose can become a big part of your life. It is important, therefore, that this first meeting goes well. As with a date, there are many things you can do to make this initial meeting a success. 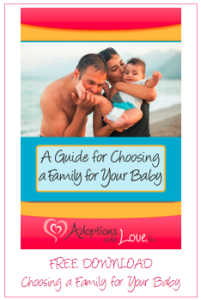 Consider the following five tips before you meet the adoptive family for your baby. Be yourself. The most important thing to remember throughout this meeting is simply to be yourself. The adoptive family you are meeting may become a forever part of your life. Show them who you are and why you are here. You will have a connection to them for the rest of your life, and this meeting will help determine if you are the right fit for one another. Think about what you want for your child. Do you want your child to celebrate certain holidays? Do you see your child taking dance lessons or playing a sport in the future? Prepare a list of hopes, dreams, and expectations that you wish to share with the potential adoptive family. By sharing this list, you can help the family make your dream for your child a reality. Think about your ideal adoption plan. Set expectations for your adoption plan moving forward. If you want to continue an open adoption plan with ongoing contact between yourself and the adoptive parents, make a note to bring that up during your meeting. If you wish to have only mediated contact with your child after he or she is born, express that to the prospective adoptive family. You will want to ensure that you and the potential parents are always on the same page regarding future communication. Prepare a list of questions. To ensure you are making the best possible choice for your baby, it is important to ask questions. For example, you may want to ask about their neighborhood, their hobbies, or how they spend the holidays. You may want to know more about how they met, or their family relationships: Do they have children or plan to adopt more in the future? Knowing their answers can help you confirm they are the right family to raise your baby. Ask someone you trust to come along for support. If you feel especially nervous about the first meeting, bring a trusted friend to help calm the nerves. Whether it is the baby’s father, a family member, or your adoption specialist, extra company you know and trust can make you feel more at ease. If you choose to bring your adoption counselor, she can chime in with any questions or concerns you feel uncomfortable bringing up. If you choose to make an adoption plan with an open adoption agency such as Adoptions With Love, we will work with you one-on-one to prepare for this preliminary meeting. If you decide that you do not want to meet an adoptive family in-person, we can still help you design the adoption plan that fits your needs. It is up to you. No two people are alike and there is no right or wrong way. At Adoptions With Love, we have found that meeting an adoptive family helps put expectant/birth mothers’ minds at ease and mends their hearts. If you choose to meet the adoptive family for your baby, you too can rest assured that you are choosing the best possible outcome for your baby. For more information, call us toll-free at 1-800-722-7731.